I'm working this week at WPPI held at the MGM Grand in Las Vegas. As you might expect, there's lots of energy, and a few new things to investigate. For this week's show, I highlight 5 noteworthy or entertaining aspects from the show that I think you might be interested in. Recorded on location. 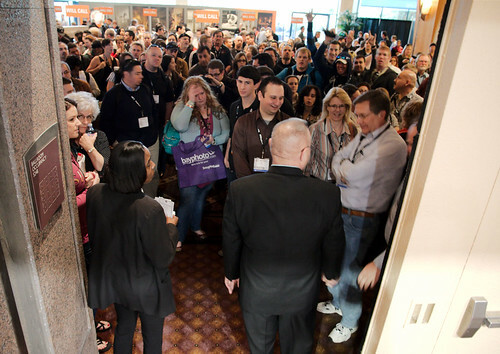 Waiting to enter the expo hall on day 1 of the WPPI show in Las Vegas. Rule of Thirds is the Feb. 2012 Photo Assignment. Entries must be adhere to a Rule of Thirds composition. You can read more about how to submit on our Member Participation page. Deadline for entry is Feb. 29, 2012.